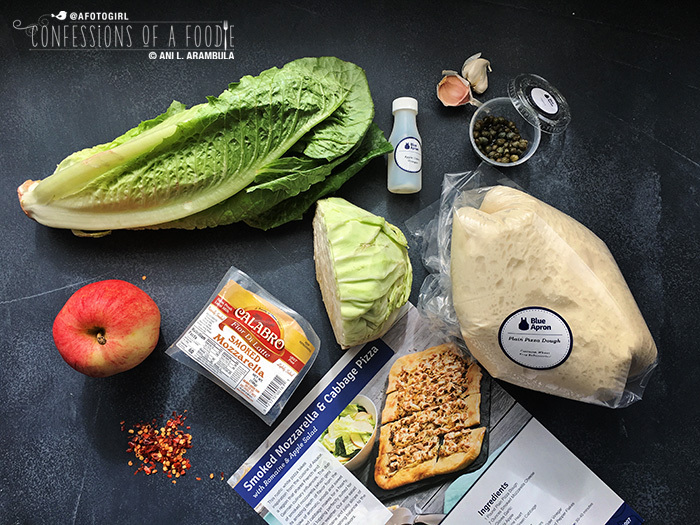 Blue Apron cook it at home meal delivery service offers up convenience and tips for cooking and exploring a variety of produce and spices. Imagine not having to spend hours of your weekend at the grocery store, list of meals for the week in hand and having to buy more than you know you need for any given recipe (how often will you actually use oyster sauce or an entire can of chipotle in adobo sauce?). I've been cooking, styling and photographing a lot for the newspaper over the last few months and with the emotional roller coaster that has occupied my life outside of work, not much energy has been left for big weekend shopping trips let alone for creating blog-worthy recipes or even healthy weekday meals after long hours at work. Just when I was feeling like I couldn't eat another scrambled egg for dinner, along came the folks at Blue Apron – the ready-to-cook-at-home meal delivery service started in 2012 that sends you a box of pre-portioned, high quality ingredients along with step-by-step instructions to prepare your meal – inquiring in my interest to try their service and provide feedback to share with you. Of course I said yes. I already knew how convenient a meal delivery service can be having reviewed another cook-it-at-home meal delivery service last summer. But I had been curious about Blue Apron since I have several friends who are using the service. It's also a few dollars less expensive per serving than the service I reviewed last summer. So, let's have a look, shall we? 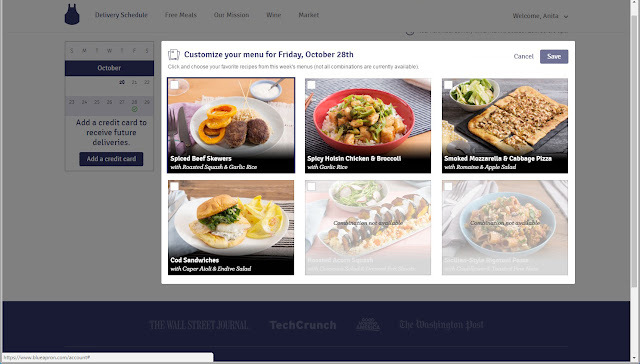 When you sign-up, you're automatically enrolled in Blue Apron's weekly delivery system. However, you have the opportunity to preview each week's menu and can opt to skip as many deliveries in a row as you want. This is especially convenient if you know you have a busy week coming up that won't allow for three to six nights of eating at home. Being single, I opted for the 2-person plan. Looking at my delivery week's menu options I have to admit, I felt a bit limited. I had only 6 options, or so I thought. Once I started selecting, options grayed out, leaving me with only 4 meals to choose from. 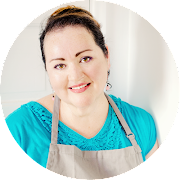 For comparison, the other service at the time of review had seven and currently offers 12 recipes including a variety of paleo, vegetarian, gluten-free, soy free and dairy free options. My final choices were the Spiced Beef Skewers, Spicy Hoisin Chicken & Broccoli, and Smoked Mozzarella & Cabbage Pizza. I would have preferred the rigatoni as my third meal over the pizza but it wasn't an option for me. Delivery day is Friday, a day that I typically don't get home from work until 8:30 p.m. I don't know what time my box was delivered but the ice packs kept the meat sufficiently cold. The produce at the top of the box farthest from the cold packs were still slightly cool and still looked fresh with no signs of wilting. Ingredients were clearly labeled for which recipe they went with, including three small paper bags called "Knick Knacks" which contained the seasonings for each recipe in small plastic packets, miniature bottles and small condiment containers. All the packaging is recyclable and depending on where you live, curb-side recyclable. 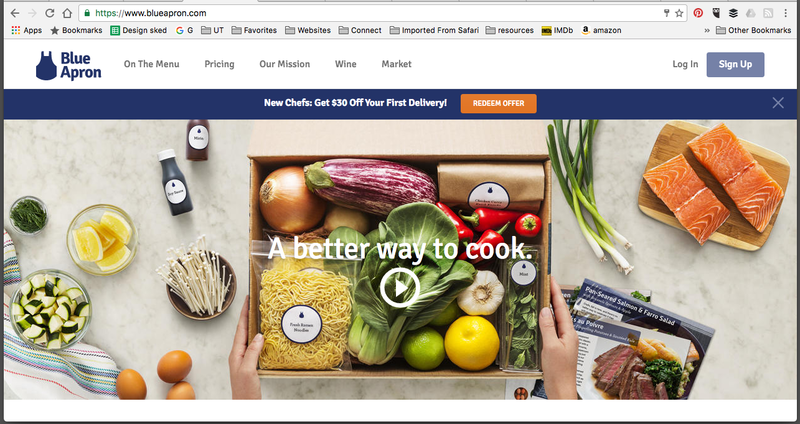 If you prefer, you also have the option of printing out a return label and returning the packaging directly to Blue Apron. 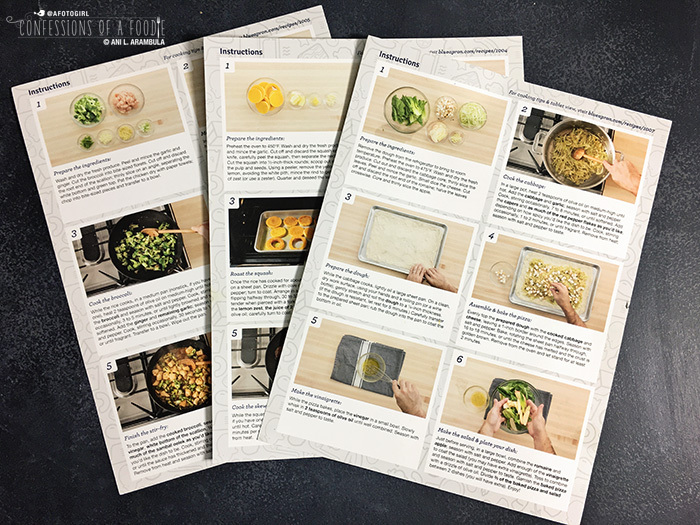 Also in the box were 8.5-inch by 11-inch sheets of instructions with photos of the finished dish and ingredients needed on one side and step-by-step instructions on the other. 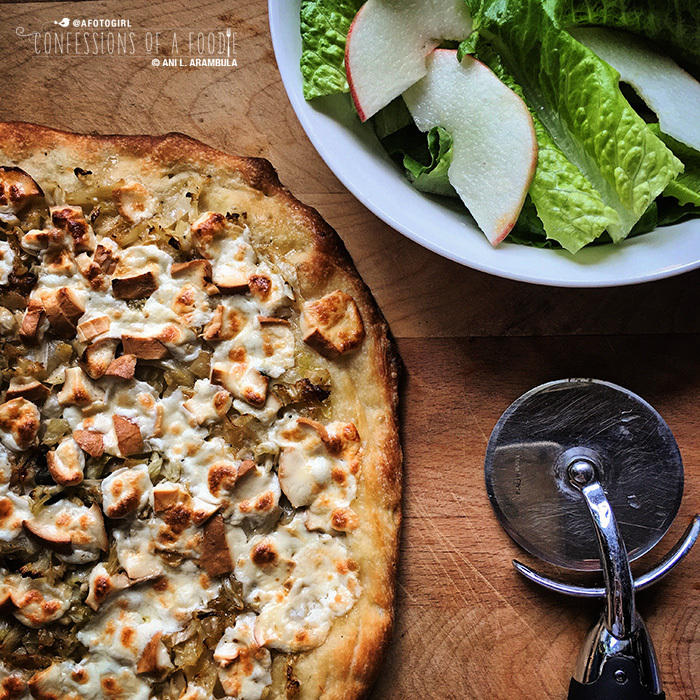 The first recipe I tried was the Smoked Mozzarella & Cabbage Pizza with Romaine and Apple salad. I admit, I was intrigued by the idea of a cabbage pizza plus, being familiar with, and a fan of, smoked gouda, I was excited to try smoked mozzarella. The instructions were clear and easy enough for any level of cook to follow with step-by-step photos of the height of the action within every step, almost like having a professional chef in the kitchen with you, looking over your shoulder. They have you prepare all your ingredients before getting started, a professional culinary technique called "mise en place" which can make you feel like you're taking a very long time before actually getting started with the "cooking" portion. But this can be very helpful for the novice cook who needs the extra time to concentrate on their knife skills without the fear of something boiling over or scorching while waiting for you to catch up. The pizza & salad: The weakest part of this meal for me was definitely the salad. It was in dire need of crunch (the description says it's crunchy romaine and juicy apple but there wasn't much "crunch" to the lettuce) and another layer of flavor. I would add toasted walnuts or pecans for crunch and to the simple olive oil and apple cider dressing, some chopped shallots and/or fresh garlic along with a small dollop of dijon. The pizza was good, especially fell in love with that smoked cheese. But again, I felt like pizza needed something. Perhaps some caramelized onions mixed in with the cabbage or maybe even some mushrooms for added protein? Or, if you aren't necessarily vegetarian, some crunchy bits of pancetta would be divine. Either way, I would definitely make this again on my own and I've even included the recipe at the end of this post, courtesy of Blue Apron. The beef skewers with roasted squash and garlic rice: I'm in love with Middle Eastern food and have had kofta before – a well-seasoned meatball, often made into a kebab, sometimes a mix of beef and lamb – and was excited to try making it at home. The supplied Ras el Hanout spice blend that went into the ground beef packed a punch of flavor. Ras el Hanout spice blends can differ according to household but typically it contains up to 10 spices (cardamom, clove, cinnamon, coriander, cumin, paprika, mace, nutmeg, peppercorn and turmeric). I loved the garlic rice and have used this technique for farro and wheat berry since making this recipe. Also, cutting the butternut squash into rings to roast was genius, the cooking time was reduced and presentation stellar. I also liked the prep on this which included both lemon juice and lemon zest. The chicken & broccoli with garlic rice: This is a super simple dish that is fast to prep and cook. I would have preferred brown rice over the traditional jasmine rice only because I like to avoid white rice and I would also add garlic to the chicken and up the scallion from 1 to 2 as well as add more broccoli. 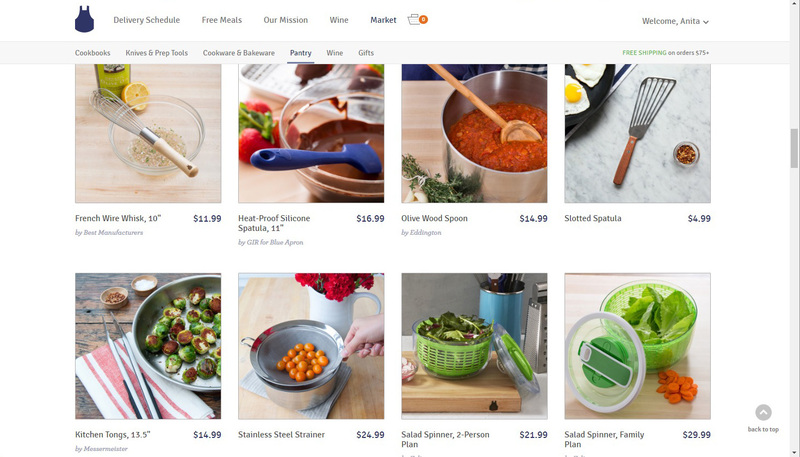 I found Blue Apron's ingredients to be high quality. The produce was fresh and in good shape. Blue Apron works directly with farmers, some produce being organic and all the farmers incorporate sustainable growing practices. The grind of the beef was a little finer than I like so I felt like the beef skewers were denser than had I bought the meat locally but it was fresh and had great flavor. Blue Apron sources their meat from ranchers that employ humane farming of their animals and source only sustainable seafood. The recipes were simple, quick and expose the home cook to spices, produce and preparations they might not otherwise have tried. For busy worker-bees who might stop at a fast food joint on the way home, this is definitely a better, healthier alternative. 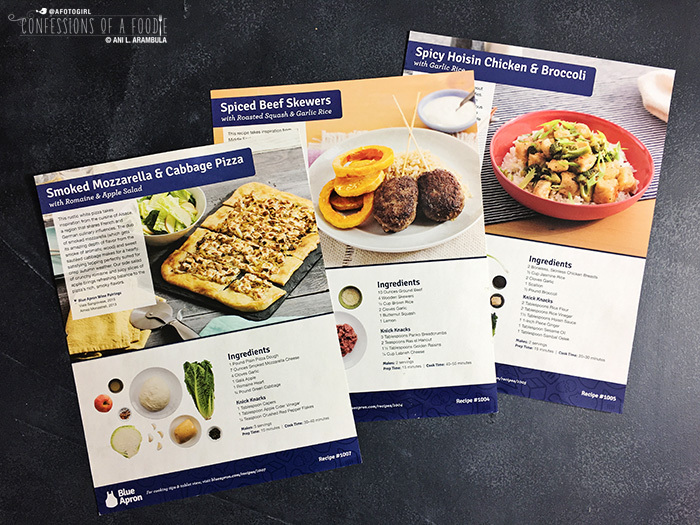 I'd like to see more options, though, and look forward to when Blue Apron expands their dietary offerings (a paleo option would be especially welcomed) as well as better at-a-glance labeling of those dietary offerings (i.e, paleo, gluten free, soy free, dairy free). I think one of the best things about Blue Apron is not having to think about what you're going to make as you're driving home from work. Everything you need is conveniently portioned out, waiting in your fridge for you to cook. And if you're single like me, then even better as you cook one night, then eat leftovers the next night. Also, the leftovers can be repurposed, if you like. For example, the night after I had the beef skewers, I chopped up my cooked beef and squash and made a hash, adding onions and bell peppers from my fridge and topped it with a fried egg. It was utterly delicious and super quick since the bulk of the meal was already cooked. If you've been thinking about trying out a cook-it-at-home meal delivery that provides convenience and a chance to try a variety of produce and spices, then give Blue Apron a go. Prepare the ingredients: Remove the dough from the refrigerator to bring to room temperature. Preheat the oven to 475 degrees Fahrenheit. Wash and dry the fresh produce. Cut out and discard the cabbage core, thinly slice the leaves. Peel and mince the garlic. Small dice the cheese. Cut off and discard the root end of the romain, half the leaves crosswise. Core and thinly slice the apple. Cook the cabbage: In a large pot, heat 2 teaspoons of olive oil on medium-high until hot. Add the cabbage and garlic; season with salt and pepper. Cook, stirring occasionally 7 to 8 minutes, or until softened. Add the capers and as much of the red pepper flakes as you'd like, depending on how spicy you'd like the dish to be. Cook, stirring occasionally, 1 to 2 minutes, or until fragrant. Remove from heat; season with salt and pepper, to taste. Prepare the dough: while the cabbage cooks, lightly oil a large sheet pan. On a clean, dry work surface, using your hands and a rolling pin, gently stretch and roll the dough to 1/4-inch thickness (if the dough is resistant, let rest for 5 minutes). Carefully transfer to the prepared sheet pan, rub dough into the pan to coat the bottom in oil. Assemble & bake the pizza: Evenly top the prepared dough with the cooked cabbage and cheese, leaving a 1-inch border around the edges. Season with salt and pepper. Bake, rotating the sheet pan halfway through, 16 to 18 minutes or until the cheese has melted and the crust is golden brown. Remove from the oven and let stand for at least 2 minutes. Make the vinaigrette: While the pizza bakes, place the vinegar in a small bowl. Slowly whisk in 2 teaspoons of olive oil until well combined. Season with salt and pepper to taste. Make the salad & place your dish: Just before serving, in a large bowl, combine the romaine an apple; season with salt and pepper. Add enough of the vinaigrette to coat the salad (you may have extra vinaigrette). Toss to combine and season with salad and pepper to taste. Garnish the baked pizza with a drizzle of olive oil. Divide divid 2.3 of the baked pizza and salad between 2 dishes (you will have extra). Enjoy! Recipe courtesy of Blue Apron. Reprinted with permission. Disclaimer: Blue Apron supplied me with a one week trial of their 2-person menu plan for consideration for an editorial review. No further compensation was received. Receipt of product did not guarantee a review nor influence the outcome of the review. All opinions are, as always, my own.